Parse.ly is excited to introduce our new iOS app. Now, digital publishers can access our best-in-class publisher analytics platform with a custom experience designed specifically for the iPhone, iPad, and iPod Touch. Our goal for the app was to take the power of our web dashboard and fine-tune it for mobile devices. The Parse.ly app includes a lot of functionality and information from our web dashboard, while making your site’s traffic extremely easy to follow. Whether you’re on-the-go or want a focused view on a second screen at your desk, the Parse.ly app is designed specifically for digital publishers wanting to stay in touch with their audience in real-time. 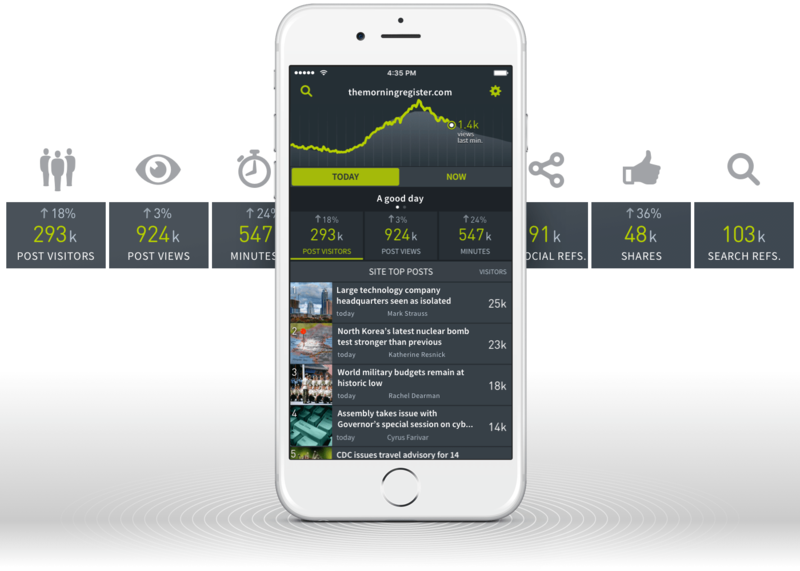 Similar to the Overview screen on the Parse.ly web dashboard, the iOS app’s main screen combines the current day’s graph of page views, site metrics, and a list of top posts. You can switch between “today” and “now” to view the stats and post listings for the current day and the last ten minutes, respectively. Depending on what metrics you have access to in the web dashboard, you’ll see the number of visitors, page views, total engaged minutes, social referrers, shares, and search referrers. Swipe left or right on the numbers to reveal all available metrics. Each metric button also allows you to sort the list of posts below. Want to see which posts are trending on social networks? Simply tap the “social referrers” button and the top posts list will refresh to show you those posts. 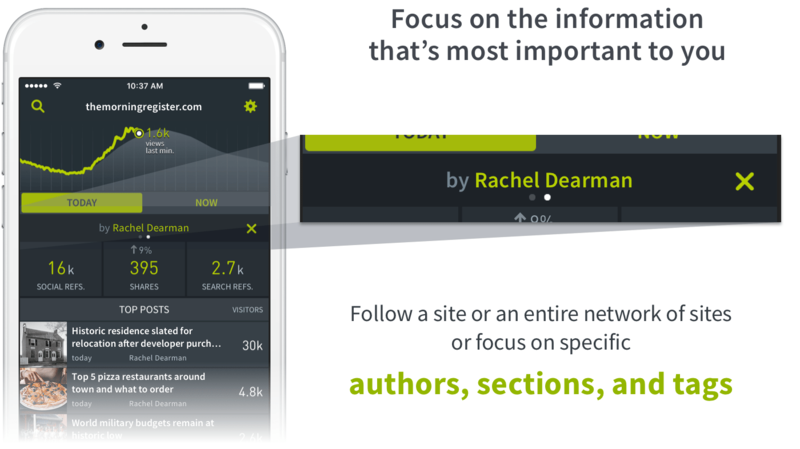 The Parse.ly iOS app allows digital publishers to track a single site, entire network of sites, or focus on an individual author, section, or tag. If you’re an author that wants to see just your numbers and posts, all you need to do is search for and tap on your name. The metrics and top posts on the main screen will filter by your selection. You can also tap on any author or section name when viewing a post’s detail screen to quickly go back to the main screen filtered by that author or section. Tapping on a post in a listing or the search screen will take you to a detailed view of how the post is performing. The page view graph for the current day is organized by referral source, so you can quickly determine when and how people arrived at that post. You’ll also see metrics for visitors, a new versus returning visitor breakdown, page views, average engaged minutes, total engaged minutes, and shares. The metrics you see depend on whether you have “today” or “now” selected, as well as your Parse.ly tier level. 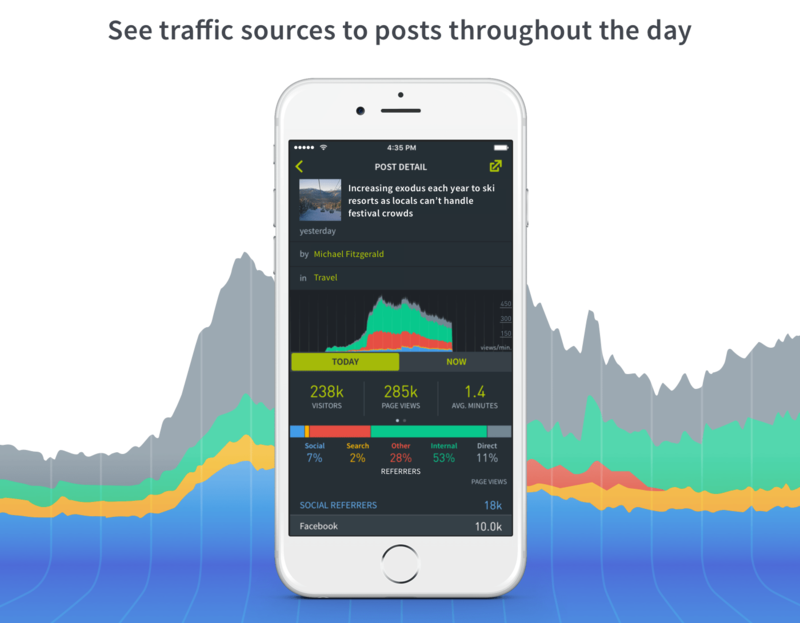 The app also provides a detailed breakdown of the specific sites referring traffic to the post. The iOS app is powered by the same data source used by the Parse.ly web dashboard, and is written with Apple’s latest Swift programming language and native iOS frameworks. This allows the app to take advantage of Apple’s latest technologies like Split View multitasking on the iPad. 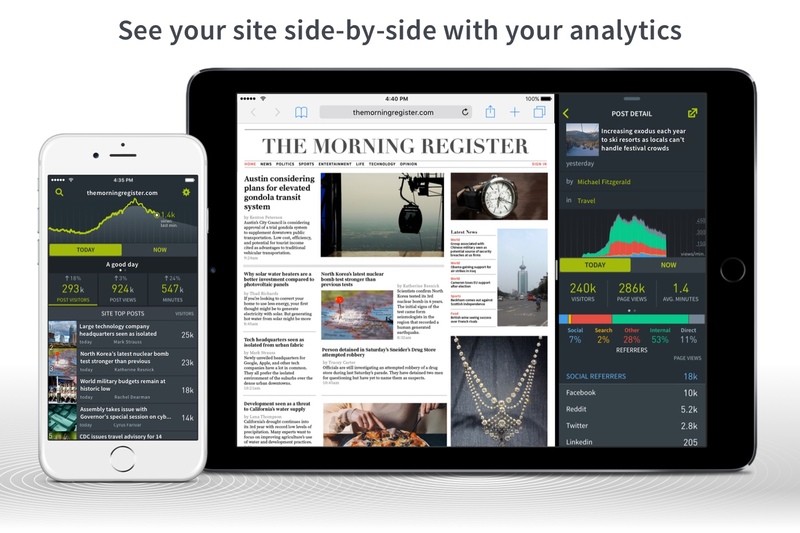 Split View lets you view Parse.ly analytics side-by-side with your site. Swiping from the right edge of the iPad’s screen while viewing your site in a browser will provide the option to run the Parse.ly app at the same time. The app is available now—for free—to our awesome customers. Please provide any feedback you may have at support@parsely.com or leave a great review in the App Store.